So, much has been made about SOGI and whether or not primary children should be exposed to these topics. There have been some gross exaggerations of what is covered in kindergarten and early primary classes, and some obvious misrepresentations of what the intent of SOGI is. Some alarmists and extremists have claimed that the intention of SOGI, particularly the Gender Identity aspect is to make ALL students gender fluid. I honestly can’t even imagine the methodology that would be required to achieve that objective – an objective that is ludicrous to anyone who works in any capacity with children. What we are trying to do is to help students comprehend that some people may have a different experience with gender and that it’s important to demonstrate understanding and kindness to people who are different. You’ll hear Anti-SOGI extremists making accusations of indoctrination. Again, these kinds of claims are simply hyberbole, and have no merit. I can’t get all kids to put their names on their papers when they hand them in or to walk down the hallway without talking. Those are things I’ve actively been trying to “indoctrinate” them with for my entire career. They’ve heard these instructions on a near daily basis in every classroom in every year of their school experience. If I can’t get them to follow those simple instructions, it’s hardly likely that I’m going to influence their sexual orientation or their gender identity by sharing a book that features depictions of LGBTQ+ characters or experiences. I spent a lifetime being educated using books and films that featured heterosexual characters and heterosexual experiences – even my parents are heterosexual – and none of that “indoctrination” made me heterosexual. When we talk about what is or isn’t appropriate for young children, I’m always amazed at how many primary school-aged children are familiar with the story of Noah’s Ark. I remember this story and can even recall cheerful lyrics about songs celebrating the story of Noah’s Ark from when I attended Sunday school as a youngster. I’m further surprised at how baby nurseries are saturated with cute images of animals marching onto the Ark. What surprises me with regard to all of this is that, at its core, Noah’s Ark is about the genocide of a planet full of people. Imagine for a moment the suffering of all those drowning victims. Imagine the bloated bodies floating as the Ark bobs peacefully among the accumulating bodies. I also remember pretty clearly the commandment “Thou shalt not kill” and the punishment in this story, for failing to obey, or for failing to demonstrate one’s absolute faith in a higher being is death. So, is Noah’s Ark the adorable story of a god preserving all the animal species of the world or is it something much more sinister? Now, I recognize that this is a very adult interpretation of the story, and it’s the interpretation of someone who feels alienated from faith communities. But it is an argument that could be made with some sincerity, and could easily be supported with logical evidence. So, if you’re going to accept some of the sinister interpretations made by Anti-SOGI extremists who base their objections to SOGI on religious scripture, it might be time to re-examine some of one’s core understandings about faith and the way that it communicates its foundational principles. If you would prefer to disregard what I’ve asserted and rely on the integrity of the members of your faith community, by all means, you have that privilege. I just ask that you extend the same courtesy to the community of professionals who are teachers, and if you want to sincerely understand what SOGI is and how it is actualized in classrooms, ask the teachers. The following is an example which I share with teachers about how to create space and provide representation for gender non-conforming or gender creative students in classrooms. I was invited into a school where a young trans student was making a social transition. The student had entered Kindergarten with a “boy” name and a “boy” identity, having been assigned “male” at birth. There had been some gender expression during kindergarten that did not conform to traditional, stereotypical gender expression. The student was then entering Grade 1, with a “female” name and a “female” identity. To clarify, a social transition does not involve medical intervention and might be seen as simply allowing for gender non-conforming or gender creative expression. A person’s appearance can change. I started by introducing myself and asking if students had seen me around the school. I talked about how sometimes when they see me I might look different. I asked them to brainstorm ways they might notice that I looked different. Suggestions that were generated were wearing a hat one day, wearing different shoes, getting a haircut, etc. I talked about how sometimes they might see me and one day I might have a full beard. On other days, I would have no beard. And on other days I might have something somewhere in between. I elaborated on how sometimes when I’ve had a beard for a while, it gets kind of fuzzy, and when I shave it off, people don’t always recognize me because I look different, but they are always able to recognize that I’m still the same person in the end. Understanding: regardless of the physical appearance, I am still the same person. Understanding: When someone shares their name, it is respectful for us to use the name they ask us to use. We talked about how to be a good friend and talked about things that good friends do (sharing, playing together, talking to each other, being silly together, etc). 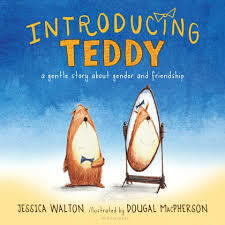 Then, I shared the book, Introducing Teddy: A Gentle Story about Gender and Friendship by Jessica Walton. The story touches on names, a character’s appearance, and friendships. I paused periodically to ask questions to clarify their understandings and emphasize how the activities at the end mirror the activities at the beginning of the story. Understanding: We can be a good friend by sharing, by including others when we play, by being kind, by helping out when someone feels bad. The story can be deconstructed on a number of levels of sophistication depending on the developmental level of students, and on topics relevant to the social dynamics in the classroom, but the key understandings developed here were 1) that appearances can change, but a person is still the same person on the inside, 2) we should call people by the names they want to be identified by, and 3) there are lots of ways to be a good friend. The aforementioned list of understandings are all age appropriate concepts and ideas for Kindergarten and Grade 1 students. 1) Non-binary understandings of gender. 2) Deconstructing stereotypical gender roles: Errol plays with his Teddy, hosts tea parties. Ava rides a scooter, and builds a robot. When looking to understand what is going on in classrooms, it is really helpful to connect with teachers. There are many voices who are trying to define for you what classroom practice is without ever having stepped into a classroom as an educator. Teachers are the ones implementing curriculum, and making judgements about the resources and methodology that they use. These decisions are influenced by the composition of their classrooms, the social dynamics within the classroom, the maturity of their students, and the connections that they make to the curriculum. And despite the hateful rhetoric you may have been hearing and the fear-mongering that has gone on with regard to SOGI, I think many of you know and understand that the vast majority of teachers have your child’s best interests at heart. So, if you continue to have concerns about what your child is being taught in their classroom, take the time to have a thoughtful, respectful conversation with your child’s teacher(s). Try to avoid charging in and demanding that your child be removed from the classroom when any mention of SOGI occurs. You might just be asking to excuse your child from learning to read, from studying social studies, or from investigating science. You’d be surprised how quickly your fears about SOGI can evaporate if you actually listen to the people who are tasked with covering this content.